It's not to look cool (even if it does look cool). They may look intimidating, but "chains are an advanced tool to make gains on basic lifts: benches, back squats and deadlifts," says Dianna Scotece, a Tier 3+ trainer at Equinox in New York City. When you wrap chains around a barbell, you create a means to work harder and gain speed throughout an entire set, even on slow lifts. How speed helps: "To work through the sticking point," explains Keith Allaway, a Tier 3 trainer at Equinox in New York City and a USA Weightlifting Level One Performance Coach. "This occurs when the weight feels heaviest in a certain area and your strength cannot overcome the resistance at that point. The deep positions of these lifts make sticking points difficult to overcome." Also, with a chain attached to a barbell, the weight increases linearly as distance from the ground increases. In short, the higher the bar is raised, the more weight you lift. Chains don’t restrict you, but actually help the weight move freely. Think of it as a makeshift resistance machine—but even better, as it allows for free range of motion to help overcome the dreaded sticking point (that point in a lift that you can't go any further and bail out). Not surprisingly, you'll use chains for slower lifts, like deadlifts, squats and bench presses, as opposed to ones like snatches or clean-and-jerks. While it's tempting to run out in search of metal links, remember that working out with chains is not for the novice lifter. The benefits are real, but this technique is an advanced tool utilized by experienced athletes. "While it looks like something a Neanderthal might use, it does take skill," says Scotese. 1) Do your math: As a guideline, you want to use chains that are roughly 10 percent of the barbell weight. 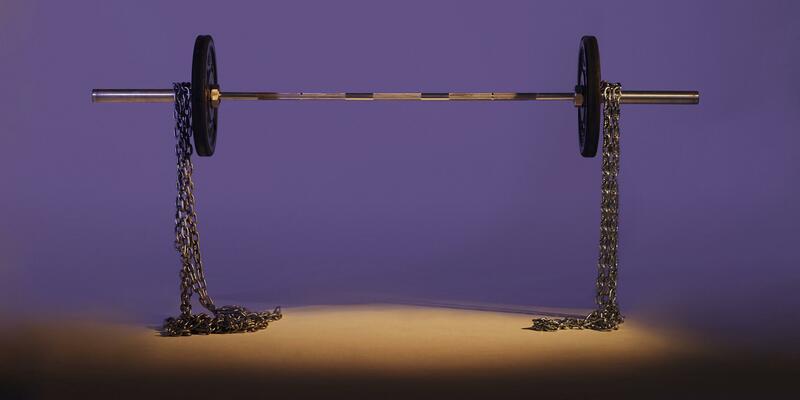 If the weight of the barbell is 300 pounds, for example, each chain should weigh 30 pounds. 2) Introduce chains gradually:Chains should be reserved for only someone who already has a considerable amount of time and experience under the bar, says Allaway. "Nearly all beginners and even intermediate lifters will do better when following a weight program that gradually increases without chains. Slowly introducing chains will alleviate the risk of injury," he says. 3) Try Allaway's starter workout:For anyone lifting with chains for the first time: Begin training with speed reps without a chain to get your body acclimated. Begin at 55 percent of your repetition maximum (1RM) and accelerate the bar as fast as possible. As experience grows, increase by 5 percent each week. Once percent speed reps become easy, add 15 percent from chains and drop your percentage to 70.